Wheelchair curling. Amazing Disabled Players Make it Look Easy. 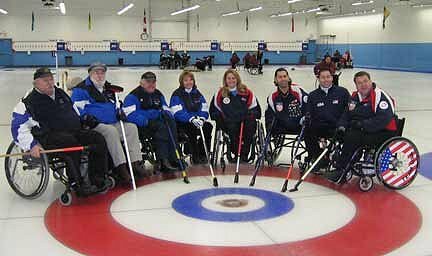 Wheelchair curling is a sport for paraplegics. It is a sport that combines a lot of skill and it takes a ton of strategy to be a winner. Wheelchair curling is the only Paralympics sport that comprises teams made up of both men and women on the same team. The Torino Paralympic Winter Games saw the first entry to this sport. The sport requires that the entrant must have a disability to the lower half of the body. You must require a wheelchair for mobility. Your disability could include double amputation, multiple sclerosis, a spine injury or cerebral palsy. In this sport no brooms are used as in curling for the able bodied athletes. Because there is no sweeping of the ice, strategy is most important. In able bodied curling, players are allowed to sweep the ice in front of the stone as it is sliding. The rapid sweeping causes the ice in front of the stone to melt momentarily. Since there is less friction from water than ice, the ability of the stone to curl is delayed therefore allowing the stone to be steered as the players desire. This is why it takes more skill to curl without sweeping. The person throwing the stone must calculate distance and the amount of curling the stone will turn. The stone glides on the surface of the ice because the ice has a surface that is similar to a pebbled effect. Skilled icemakers will set up the surface once the temperature of the ice is maintained at about 25 F or -5C. The pebble effect is applied by an expert using water droplets. During the game the pebbles act upon the stone causing it to curl or turn. The pebbles slowly get knocked off as the game progresses thus changing the curling effect of the stone. The ice surface is 146 feet long and approximately 16 feet wide. The 12 foot set of rings, called the house, are the target and the distance from the center, or button as it is called, to the backboard is 16 feet. There is a line drawn that is 37 feet from the backboard and that is called the hogline. Any stone that does not even touch the house is not counted. Be sure to see Sledge Hockey as well as Paralympics Biathlon Skiing and Shooting. A gentleman named Rusty Drew passed away early in 2008. He was the inventor of the extender curlers cue. It is so named because it extends the playing career for those curlers who cannot handle the wheelchair curling stones by bending down. Disabled curlers use them while in the wheelchair. The stone is released by pulling back the cue at the last moment of the push.